The most important thing to remember when deciding on a Web Design Firm is that not all Web Sites are created equally. Sure, you could save money and get a techie in your IT department or maybe even your neighbor’s teenage son or daughter to throw some Web pages together for you. But before you entrust someone with the responsibility of creating a marketing vehicle to present your corporate image to the global community, stop and ask yourself, do they have the design and marketing skills to create a Web presence which will enhance your company’s image rather than harm it. Simple, clean and uncluttered websites are what we thrive on. Our simple website design service is for businesses, organizations, and individuals that are looking for a simple website without a bunch of unwanted features, yet maintains a consistent, clean look and feel that fits their theme and focus. With this package, you can select which options work best for you. You get a custom user interface design plus the custom options you choose in the list below. Our strategy is simple: a fresh look, room to breathe, and visual usability yields smart web design. 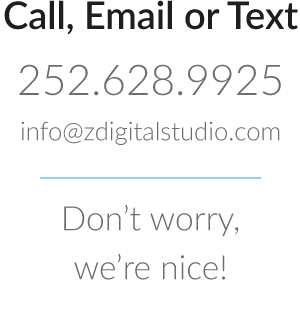 If you are a small business looking to build your web presence, or a large business looking to increase your placement in the search engines, Z Digital Studio has a solution for you. Our experienced team asks the right questions to make designing your website a painless and fun experience. Designing a new website can be a pretty daunting experience. If it isn’t done right the first time, constant revisions can become costly and frustrating. We pride ourselves on the ability to get it right the first time, and have minimal revisions. We can even train you to update your own website. Warning: While there are some “off the shelf” programs you can purchase to help you create your own website, there is still no replacement for a professional and custom designed website. Let us provide you with a free initial consultation. Too often (way too often) we hear from people that were burned by their original web designer. We can assure you that we are not going to leave without finishing your website. We can also help you pick up the pieces. We will redesign what the other guy screwed up, and help you get back on your internet feet. We won’t hunt down the bad guys, but we will clean up their mess so that you can move forward. Keeping your website content fresh and up to date is key to having customers return to your site and to keep them interested in your company and your products. It is how you build customer loyalty, and develop new customers. If your website is over 2 years old, it may be out of date. Technology advances everyday, and it is important that your website reflect the “latest and greatest”. If you don’t do it, your competitors will. Also, the search engines frequently change the parameters used to judge and rank websites. If your site does not reflect these new algorithms, you could drop in the rankings. We commonly hear from our new clients that they built a website but haven’t had any time to update the site. If you are in a similar situation, and are looking for a team to keep your website text and images looking fresh and exciting, you’re at the right place. Keeping content fresh on your website is critical to search engine placement. Search engines love to see fresh content on your site, and will often index you more often and give you brownie points for keeping your content fresh and relevant to your website topics. We have many plans that are affordable, and our estimates are always free.